A briefer from U.S. Immigration and Customs Enforcement stood outside the closed-door meeting Wednesday while negotiators working on a homeland-security spending deal heard from border experts, who made their pitch for a border wall. Even Senate Republicans’ ante would mean cuts to ICE’s ability to hold all the illegal immigrants the agency says need to be detained if the government is going to begin to make a dent in the illegal-immigration problem. Left outside the room, ICE has instead produced a briefing document for the negotiators. The document defends the president’s call for 52,000 detention beds and says both Democrats plan — cutting ICE to about 35,520 beds — and even Senate Republicans’ ante of about 40,520 beds would mean dangerous migrants would have to be set free. Both Democrats and Republicans negotiating the spending bill acknowledged beds are a major sticking point, along with the wall. “It’s one of the things that are being negotiated,” said Sen. Jon Tester, Montana Democrat. He disputed ICE’s claim that 30,000 migrants, including thousands of criminals, would be released under the Democratic plan. “I really doubt that would be the case, but we’ll see,” he said. Lawmakers also said they were happy to hear from Border Patrol officials Wednesday, who provided a secret briefing about what they need in terms of border wall. “That was really the focus of the meeting, rather than ICE’s role. We’ll have funding in the package for ICE. The pushback that we’ve been getting is on the border barrier funding,” said Sen. John Hoeven, North Dakota Republican. Senate Appropriations Committee Chairman Richard Shelby, Alabama Republican, said they heard from the people they thought they needed — and that was the Border Patrol. “I guess you look back in retrospect, say we could have brought so and so in. I thought the meeting yesterday was overall very good — told us some things that we needed from the experts — not something we politically thought of,” he said. Immigration experts, though, said detention beds are a critical component if Congress’s goal is to reduce illegal immigration. “The border wall’s not unimportant, but we’re going to get more bang for the buck for detention than for extra fencing,” said Mark Krikorian, executive director at the Center for Immigration Studies, which advocates for stricter immigration controls. “I’m not against extra fending, I’m for it, but we put inordinate emphasis on it, when in fact holding people in detention to make sure they show up [for deportation] is going to be a more effective deterrent to future people,” he said. But detention is anathema to immigrant-rights advocates and some left-wing Democrats in Congress. Fellow freshman Rep. Ayanna Pressley, Massachusetts Democrat, said she didn’t want to see either Customs and Border Protection or ICE get any more money. 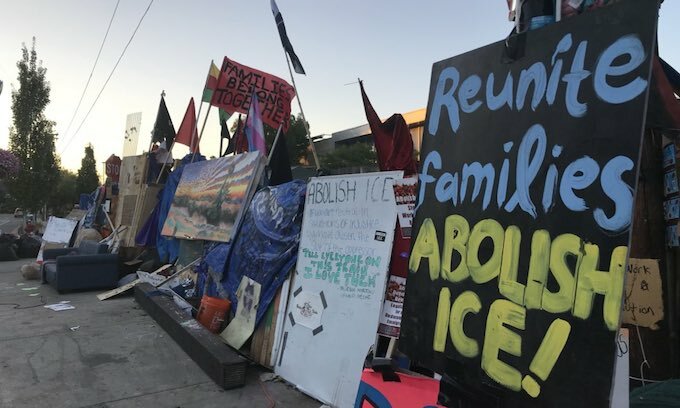 “The deal reached by the conference committee should not allocate one more dollar to this department or to the ICE and CBP agencies,” she said. Democratic negotiators are aware of that sentiment, and an aide tracking the deal-making said the number of detention beds in a final agreement is “very important” to Democrats. The aide also countered ICE’s claims of mass releases, saying the agency wouldn’t have to release everyone at once, but could ratchet down its detention and come up with better priorities for who has to be held. But Democrats’ proposal would not only cut the number of beds, it would also limit who could be held, cutting the number of people able to be detained from ICE’s arrests within the interior of the U.S. to 16,500. “ICE is currently detaining recent border crossers who have passed asylum interviews for too long, and they are arresting many people in the interior of the United States who are not criminals or who have minor criminal records, including many with only immigration violations,” the Democratic aide said. ICE currently has about 46,000 people in detention, well above the mandated floor of 40,520. Of those, about 21,000 are from interior arrests — mostly criminals. Democrats’ plan would mean perhaps 4,500 of them would have to be released in order to meet the 16,500 limit, according to an administration official. Democrats say they want to see illegal immigrants put on ankle monitoring devices or given counseling and regular check-ins, rather than be put into detention. Their plan would raise the number of people in alternatives to detention from 82,000 to 100,000. In particular, Democrats want to phase out family detention, calling it cruel. ICE says that would force them into a catch-and-release policy. Already, one ICE office in El Paso, Texas, is releasing 300 to 500 family members a day. Immigrant-rights advocates say it’s cheaper to release someone on alternatives than to hold them in detention. A 2014 audit found keeping someone on alternatives for a day costs just 7 percent of what it does to keep someone detained. But ICE says there are downsides. Some 30 percent of illegal-immigrant parents caught and released with an ankle bracelet cut the bracelet off in the first days after being released, an ICE official testified to Congress last year. And since people in detention have their cases heard faster, they are deported faster. Homeland Security says that in 2017, 2,430 migrants were deported after being kept on alternatives to detention, at a cost of $183 million. That works out to $75,360 per deportation. The department says if that money had been used for detention, it could have helped deport 10 times as many people. Democrats, though, say the administration is inflating the border situation. While Republicans’ border security plans focus on illegal immigration, Democrats say the bigger threat is drug-smuggling. Rather than boost border agents and deportation officers, they have called for more technology and officers at ports of entry to screen cars and trucks for banned drugs, and Homeland Security agents to target drugs, gangs and cybersecurity. Democrats’ plan also calls for millions of dollars in additional funding to improve conditions at detention facilities. Our government is destroying us from the inside. Where are the actual Americans? Why are the Democrats and RINOs so determined to turn this country into North Venezuela? Because for decades, they’ve been seeing NO REPERCUSSIONS or accountability for their outright Treasonous actions..
time has come to march on washington dc and let our disaproval be heard across the land. We imo need to do MORE than just march on DC… BUT i fear what i’d LOVE TO SAY should happen to all these scumbags, would wind up landing me in jail.. If detention of illegals is wrong then why don’t we just send them back across the border immediately upon arrest. We do not want them. We do not need them. They are criminals just by being here. And stop giving anyone other than tax paying citizens any benefits. Most/all other nations simply turn you away! Why don’t we do that? If you let the little cockroaches step one foot on our soil, they get to stay. Our politicians are letting this happen. We owe the illegals NOTHING. We need walls and and thousands of miles of concertina wire. That’s something i;ve advocated. WHY EVEN HOLD THEM. Why spend US tax payer money to house, feed, cloth, medic them and give them court hearings. WHEN WE grab them, just stick them in a plane and drop them off back home. The Libs and RINOs are working hard to bring about their own extinction. If they think the Pres. is going to fold, they’d better think again. You can push people only so far. Sooner or later We the People are going to start pushing back and it won’t be with talk. I am sick and tired of the Democrat Party, and their idiotic ideas ! As far as I am concerned, these people care NOTHING about the American Citizens. Their ONLY interest is helping Illegals, and by THAT, getting many MORE Democrat votes ! To keep this Country safe, we MUST vote Republican, otherwise we are RUINED ! Come on, don’t you know, the progressive socialist democrats do not need any advise from anybody. They have all the answers and don’t need ANY information from Ice or the Border Patrol to solve the problems. Just do as your told and obey. %**##!!! Just remember NOT ONE Democrat voted Yes for Kate’s Law, how do they live with themselves. I am so sick and tired of the weak-kneed Senate Republicans. The only thing they’re good at is losing. Yeah right. Do something with what you have now and then we’ll talk. Losers. That is why i often say, i’d not shed a single tear, if EVERYONE in congress right now, upped and got blown up from an asteroid. Or died from a virus. Or what ever. THEY ARE ALL useless feckless wastes of oxygen. This is the end result of not calling out and punishing the GOP for their complicity. We would not be here if it were not for the traitorous Republicans colluding with the Radical Commie Left AGAINST Pres Trump. Without an Opposition Party the RADICALS will go UNABATED, which is what has happened. We are now on the precipice of destroying this country. And STILL the GOP are MIA. It is time for us to send a message to the SPINELESS COMPLICIT GOP that this will not be tolerated any further. Any Republican who refuses to stand with this president needs to be called out, humiliated and dismissed. It’s time to throw out the garbage.